The unions’ “inside” strategy of consultation and lobbying needs to be paired with a Seattle-style “outside” approach involving many thousands who force corporate and government elites to respond to the urgency of the crisis. Already, 150 million “climate refugees” have been forced to leave their homes because they can no longer grow crops due to disappearing glaciers, or have been displaced due to droughts, flooding, and climate-induced diseases like malaria. In many, mostly poor countries and regions, the impact of climate change is already severe. Several hundred labor representatives organized by the International Trade Union Confederation will spend 2011 preparing for the big showdown at the climate negotiations in Durban, South Africa, this December, hoping to help stop this disaster from spinning out of control. The ITUC is a global body that represents 176 million organized workers in 151 countries. Unions must work with other social movements to turn these climate talks into a rallying point—and some U.S. unions could start by embracing the call for climate justice and breaking ties with polluting employers. Climate justice makes good sense for workers, because the more ambitious the emission reductions commitments, the greater the number of climate jobs that are likely to be created across the economy. Already, the unions ensured that the principle of “a just transition for the workforce” was included in the report issued in Cancun. The principle recognizes that policies are needed to protect those workers who risk losing jobs in the transition to a low-carbon economy. A “just transition” would guarantee that communities and workers who lost jobs in high-carbon industries would get long-term assistance, including investments for reconstruction to ensure coal-mining communities, for instance, don’t become carbon ghost towns. 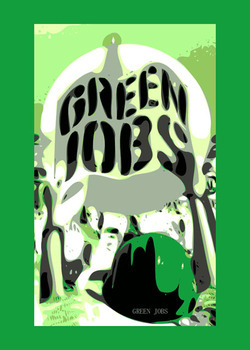 Labor’s presence in climate talks has helped swell the army of progressive organizations and social movements that are pressing hard for a fair, ambitious, and binding global agreement when the Kyoto Protocol—a flawed first attempt to cap carbon emissions—expires in 2012. In Cancun roughly 200 trade unionists from all over the world joined the ITUC’s delegation. These union representatives not only acknowledge the huge threat posed by global warming to existing jobs and livelihoods, they also realize that dealing with the climate crisis presents an opportunity to bring about a fundamental shift in the course of economic development. Decisions taken (or avoided) in the next few years are likely to have serious long-term implications for workers and for human civilization in general. The greatest challenge to a strong global deal comes from a push by the U.S. to replace legally binding emissions reduction targets with voluntary commitments. Bargaining with nature, however, is simply not an option. The science is clear: While doubters have tried to discredit the scientific evidence by pointing to one flawed study, they have no answer for the thousands of studies showing the climate is in trouble, including some—like those highlighted by NASA scientist James Hansen—saying the situation is far worse than first imagined. That’s why the ITUC has consistently fought for science-based emissions reductions target. A voluntary system would enable rich countries to limit their actual reductions. Indeed, the pledges from developed countries at Cancun to cut their emissions amount to 16 percent reductions on 1990 levels at best. That puts the world on course for 5.4 to 9 degrees Fahrenheit of global warming by the century’s end. The consequences of this level of warming are almost unimaginable—half of Florida, for instance, could be underwater. Global labor endorsed the UN’s 2007 call for deep cuts in emissions consistent with the findings of the Intergovernmental Panel on Climate Change. The “IPCC scenario” requires developed countries to reduce their emissions by 25-40 percent by 2020, based on 1990 levels. Such deep cuts are the responsibility of developed countries, because they have produced 80 percent of the cumulative emissions thus far. And they are possible with an overhaul of how we produce energy and transport ourselves and the goods we consume. But some U.S. unions are on the wrong side of the battle between binding or voluntary emissions reductions that will dominate negotiations in the months ahead. The AFL-CIO and the Blue Green Alliance (in which the Steelworkers are a key player) have supported the U.S. government’s stance, and have gone along with the “voluntary commitments” approach. They’re concerned that U.S. manufacturing and energy-sector jobs would be threatened by a global deal that brought pressure to bear on U.S. employers. They support intellectual property restrictions on environmentally friendly technologies lest U.S. companies find themselves disadvantaged. These restrictions would make it harder to transfer technologies that fast-developing countries like India and Brazil need to reduce their carbon footprint. Other U.S. unions have backed the global union position supporting science-based reductions and a binding global agreement. They are the Laborers, Transport Workers, Utility Workers, and the Service Employees. These unions recognize that ambitious targets driving this transition can also anchor a Green New Deal, creating a lot of good quality jobs and restructuring economic life around the needs of both people and the environment. Here is where labor could play a transformative role. Traditional tools to battle the economic crisis have fizzled out. Stimulus money helped turn a terrible jobs situation into a bad one, but now municipal and state governments are slashing public spending and many face bankruptcy, so more jobs will be shed. Unions can act to turn the situation around for workers through climate policy. Unions have been stuck on defense, holding a “stop the cuts” position in mobilizations against austerity measures in many countries in recent months. They should shift to an offensive strategy, demanding a Green New Deal grounded in workers’ rights, labor standards, investments in infrastructure, and a strong public sector. Sustained pressure from unions and other social movements could enable bold state interventions built around long-term public investments in mass transit, energy conservation, grid modernization, and renewable energy to address the crisis in jobs and climate simultaneously. Such a forward-looking approach builds unions and strengthens alliances. Last September, the global union federations (somewhat like an international AFL-CIO) came together to launch the “Quality Public Services” campaign, which makes the connection between climate protection and the need for a strong public sector. Unions everywhere can adapt the model, helping ensure that labor’s “inside” strategy in official climate talks is backed by an “outside” approach—educating and mobilizing members and communities around expanding environmental protections and public services. December’s climate negotiations will bring an excellent opportunity for labor and climate activists to join South Africa’s robust union movement in the streets. The real issue is not the size of the demonstration outside the talks, however, but whether or not the opportunity will be taken to bring the severity of the climate crisis and the opportunities it presents into union halls, communities, and gatherings around the world. Sean Sweeney is director of the Global Labor Institute, a program of the School of Industrial and Labor Relations at Cornell University. This entry was posted in Organizing and tagged Labour. Bookmark the permalink.